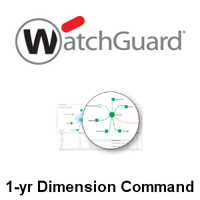 WatchGuard Dimension™ is WatchGuard's award winning network security visibility solution. Its suite of big data visibility and reporting tools allow you to instantly identify what is going on giving you the ability to make fast, well informed, critical decisions about the security of your network. Create Executive Summary reports for the board room or drill down to key details in individual logs. Identify who is using the most bandwith or which websites are being visited the most. Choose from over 70 reports that can be scheduled and emailed to key stakeholders. Produce reports for PCI and HIPAA compliance. Use Dimension Command to access to a host of network control features including one-click configuration changes or the ability to jump back to previous configurations. Dimension Command can be added as an upgrade to any Firebox with an active Standard Support license and is also included in the Total Security Suite. 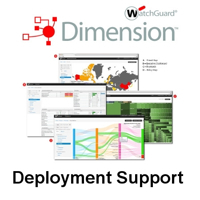 WatchGuard Dimension™ is included as standard with any active firewall license. Available as an OVA or VHD file, it can be deployed on both VMWare ESXi 5.x-6.x or HyperV. Here at WatchGuard-Online we can offer you support for your Dimension from remote setup for in-house deployment to a fully managed and hosted service in our secure data centre. Call us on 03300 88 1114 to discuss your requirements or request a free, no-obligation trial on our secure platform. 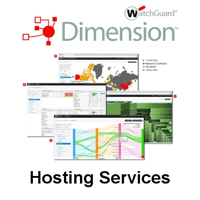 WatchGuard Dimension hosted on our secure platform in our UK based datacentre. We have options to suit all requirements and budgets from a basic package to a fully managed service. Remote deployment support from one of our in-house WatchGuard certified engineers for WatchGuard Dimension.